Oh, don’t bother filling in the blanks, there’s actually nothing going on in the poochie’s minds. They were just standing in a sunlight-induced trance in Paul’s office this morning. 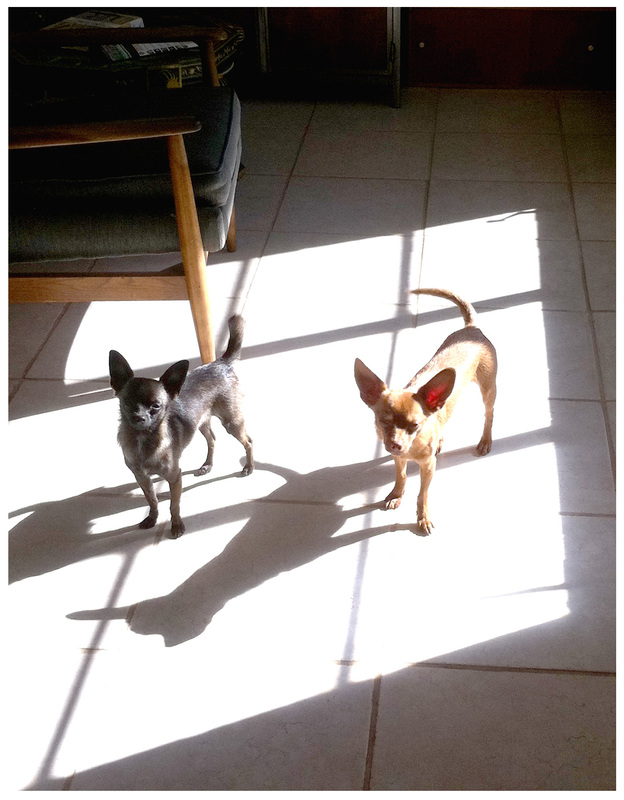 In love with the newfound warmth of these recent rain-free days, they actively seek these sun pools for zoning out. Lucky dogs, they don’t have to use these warm, bright days for all manner of running around and yardwork in preparation for the upcoming garden tour … (Between you and me they’ll be off-site at my sister’s house a week before, and during, the tour … but don’t tell them that. I’d hate to disrupt their sun-induced reverie). Aw… They got to be filed away. Poor poochies. Well I could understand, no room for incidents. Way too stressful! That is why I built a set of three large kennels. You love them, but sometimes your company doesn’t. And way safer for them too. Their insane barking would’ve been really off-putting during the tour; I’m estimating close to 500 people came through and it would have driven at least me around the bend! Believe me, they were in the lap of luxury at my sister’s house, blissfully unaware of the stress at home … plus they enjoyed a total sniff-a-thon upon their return: imagine the smells of 500 people to enjoy!